Our beautiful very own Elite stainless round medical charm with etched front and shiny border. Choose from 7 caduceus medical emblem colors to suit your style. Back features 5 lines of traditional etched engraving. Add your charm to any Creative Medical ID bracelet design or attach to your own jewelry! 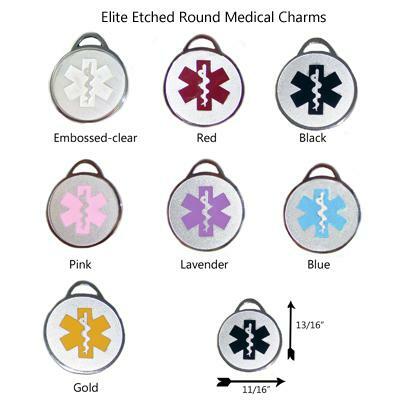 Select from, Embossed (Clear), Red, Black or Pink, Lavender, Blue Gold enamel "Star of Life" emergency medical emblem. Optional lobster clasp. Price above includes engraved Elite round stainless medical id charm with stainless split ring. 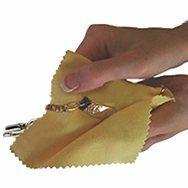 We will engrave your important medical information directly on the back of the charm in Capital letters, block font. Please type engraving in CAPITAL letters!Be sure to leave spaces between words for clarity!